When snow at the spurs of Fuji starts to melt, a wind is coming off the top and picking dainty flowers of sakura. Wind blows them with a pink blizzard to a lonely pine on the rock, under which an ironclad and proud-hearted lonely warrior monk, dressed in domaru, stands and muses upon a distant scene. Dressed in domaru armor! Classy, comfortable and cross-functional armor for anyone, who would like to get a feel for rich culture of Japan and feel like a samurai just for a short while. So, here is definitely the most practical model of all types of Japanese armors; well protecting, but leaving a fighter mobile; stylish and impressive, but not too cluttered with decorative elements. 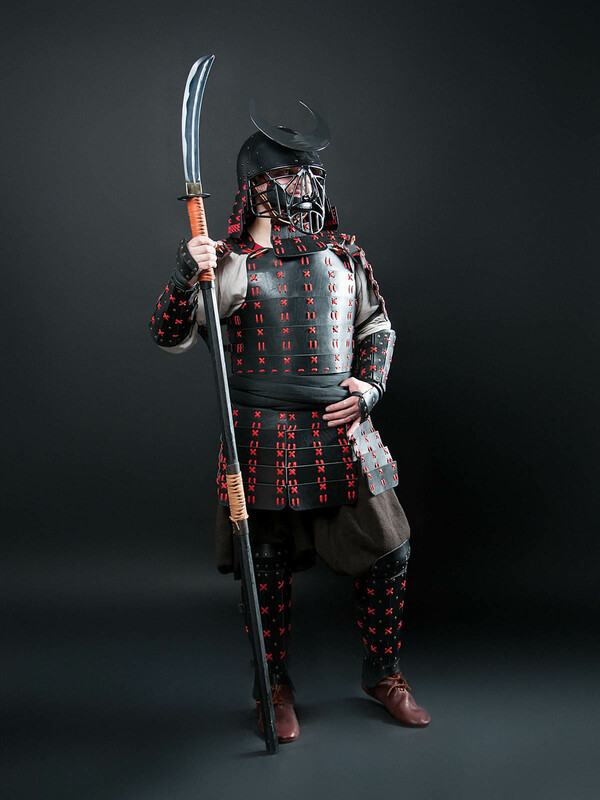 If we goes to the historical roots, so pre-Sengoku Japanese armor, with which we are concerned, was developed from the armor, used in ancient China and Korea. 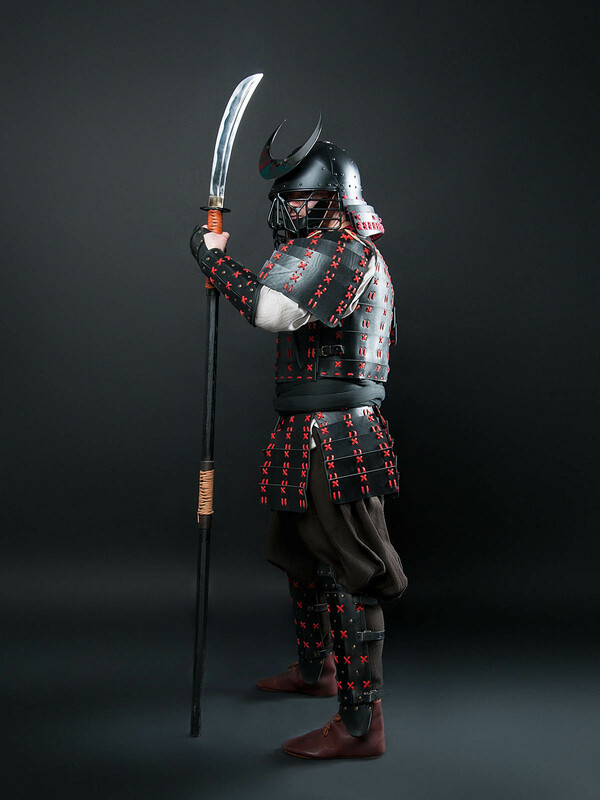 From such pre-samurai armor as tanko and keiko, it became more complicated and developed to kozane dou gusoku, an armor, more familiar for our eye. 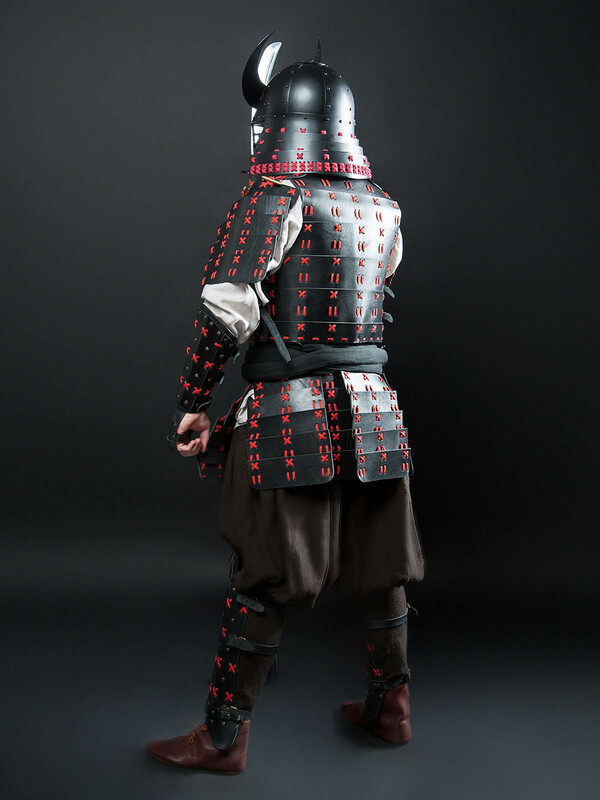 This armor looked as a lamellar cuirass, consisted of separate plates kozane, which gave name to this type of body protection. 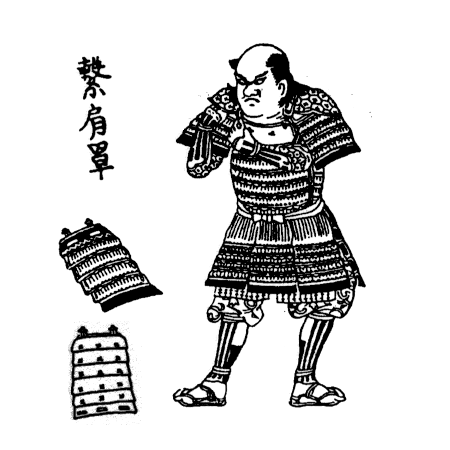 Hon-iyozane dou – armor of big plates. 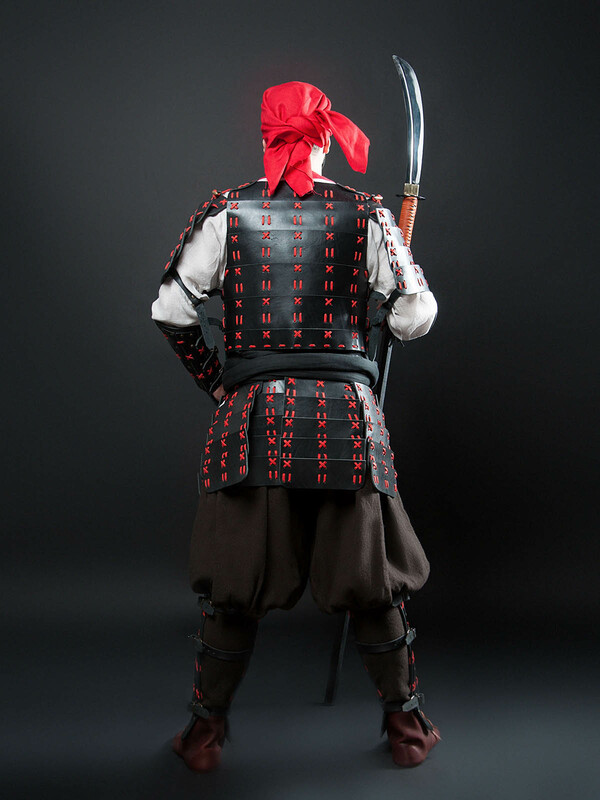 Name of this slightly doaru armor (胴丸) may be translated as “a one that goes round a body”. This younger brother of splendid ō-yoroi appeared together with it in Kamakura period in the end of the XVV century and almost completely replaced its elder brother to the XV century. It was designed not so much for sitting in the saddle with menacing look and leading the armies, but for more practical and prosaic battle actions. Oh, commanders and their ō-yoroi were taking participation in battles from time to time, but there were much more fights for more humble dismounted samurais and their domaru. So, our hero is not overburdened with excessive flashy details, but faultlessly protects in action. Also, the fact that warrior could quite quick wear and fasten this armor without outside help became another great advantage of domaru armor. 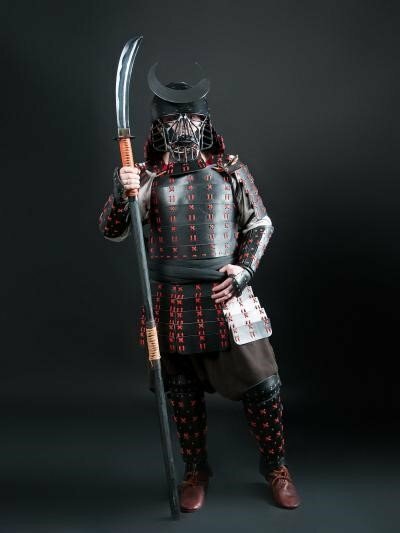 But, we cannot say the same about ō-yoroi: dressing in the Great Armour required help of servants and took considerable amount of time. 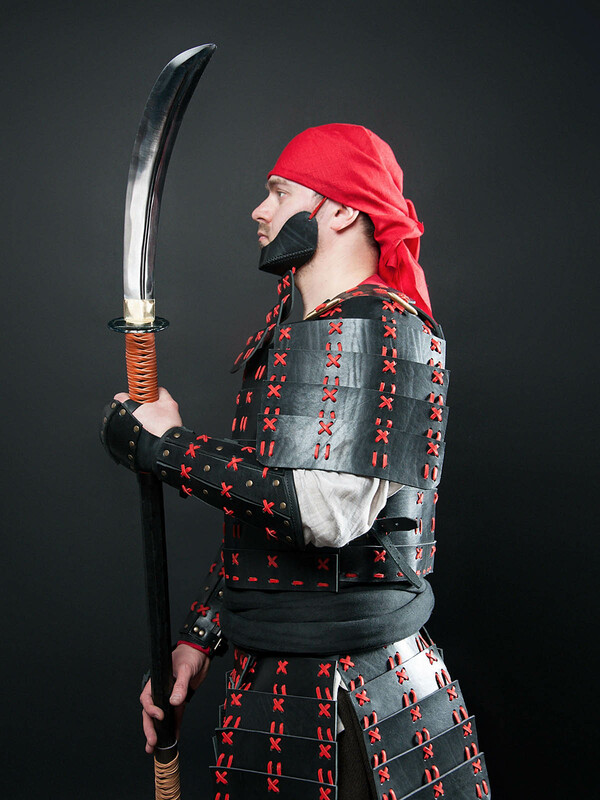 Not ordinary warriors were wearing not only ō-yoroi, but domaru as well. 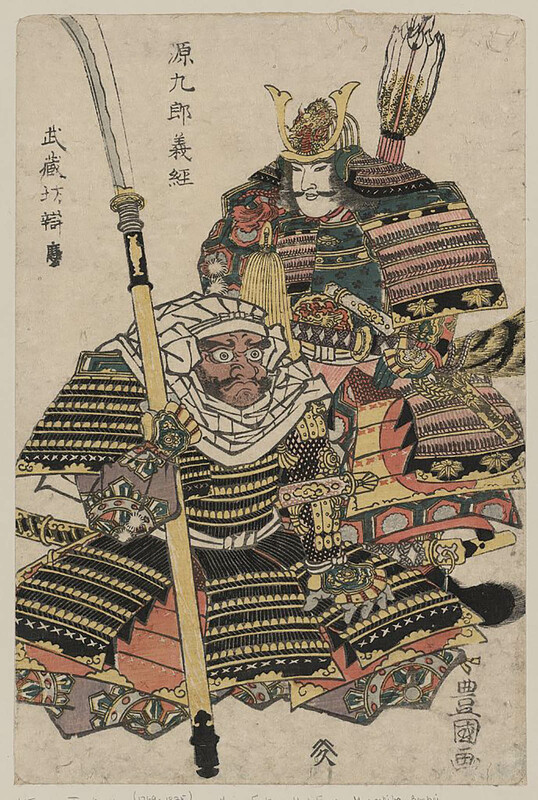 Here is monk-warrior Saito Musashibō Benkei together with one of the commanders of that epoch Minamoto no Yoshitsune. While honorable son of Minamoto clan of Japan wears ō-yoroi, modest, but legendary monk is dressed just in domaru. The same black domaru as we made, but with golden cords, not with red. So, make yourself comfortable and have a look at this armored good-looker in front of you! Though, it is modest enough, this true son of the Land of the Rising Sun is steeped in Buddhist humility, hardened by spirit of bellicose warrior monks sōhei and is perfect even in details. From the splendid black leather, equally modest and striking, to the bright and firm cord of the noble and manly scarlet color, with which armor’s parts are fastened together. However, you may choose other colours of leather and cord by your wish. 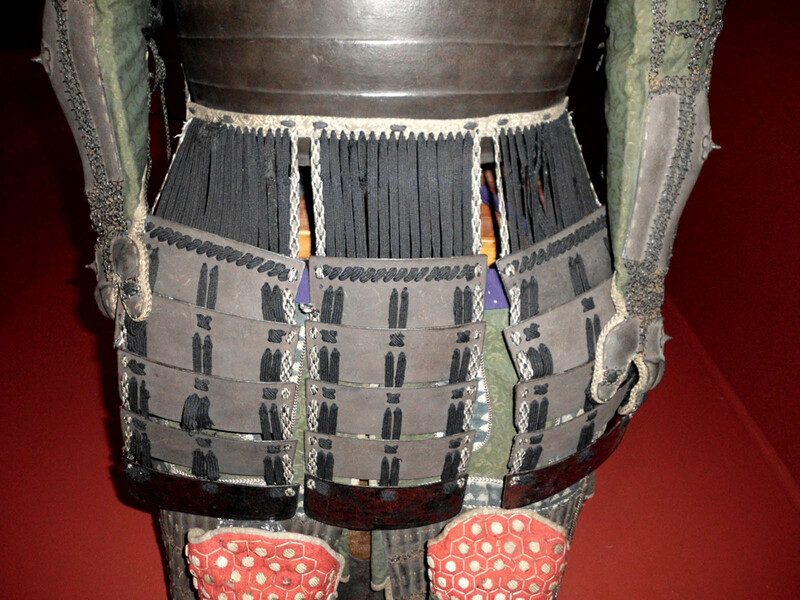 Back and chest of sōhei are reliably protected by Japanese chest plate dou. It consists of horizontal plates, which as defends well, so gives wearer good mobility on the battlefield. Domaru dou is fastened on the sides that allows perfect fitting on the body. 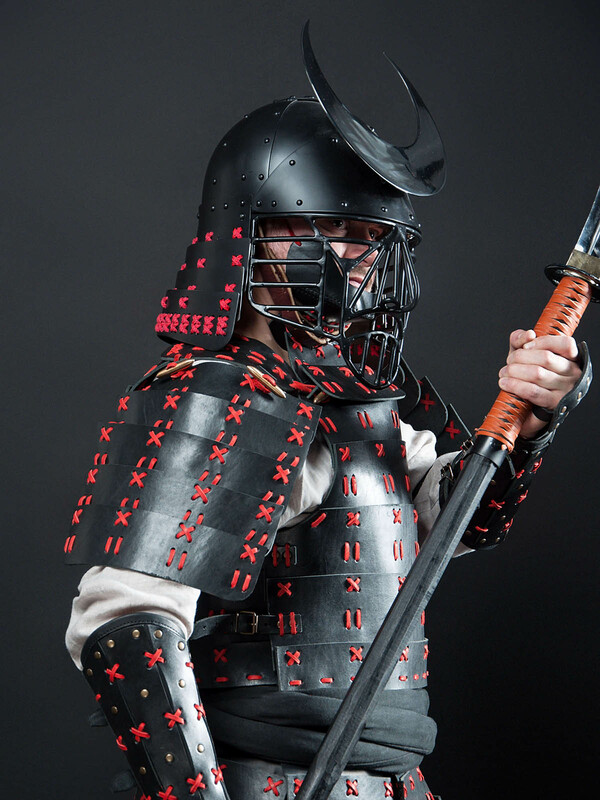 Straps watagami keep domaru armor on the shoulders. By the way, primarily, domaru was separable only from one side. In time, it was divided into front and rear parts for more comfortable keeping and transportation. Hips of the humble votary of Buddha are protected with a skirt, consisted of long and narrow kusazuri, which, in their turn, consisted of seven kusazuri of five rows each. 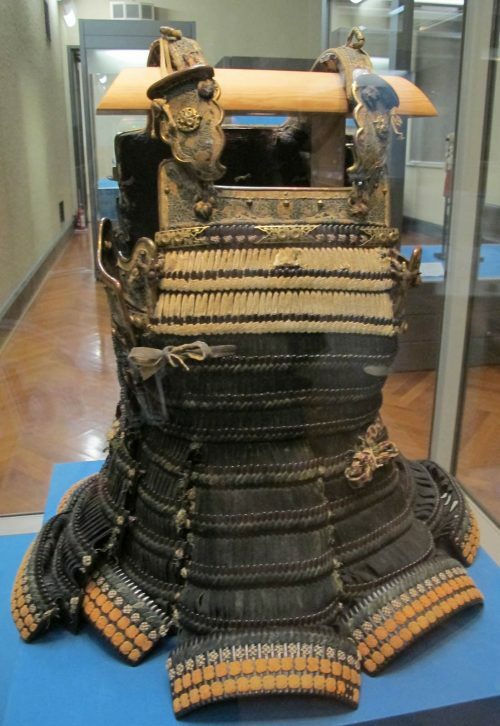 It stands to mention that early version of domary were not a Japanese shoulder armor due to lack of the shoulders by itself. So, caring about effectiveness of your protection, we recreated later version of armor. 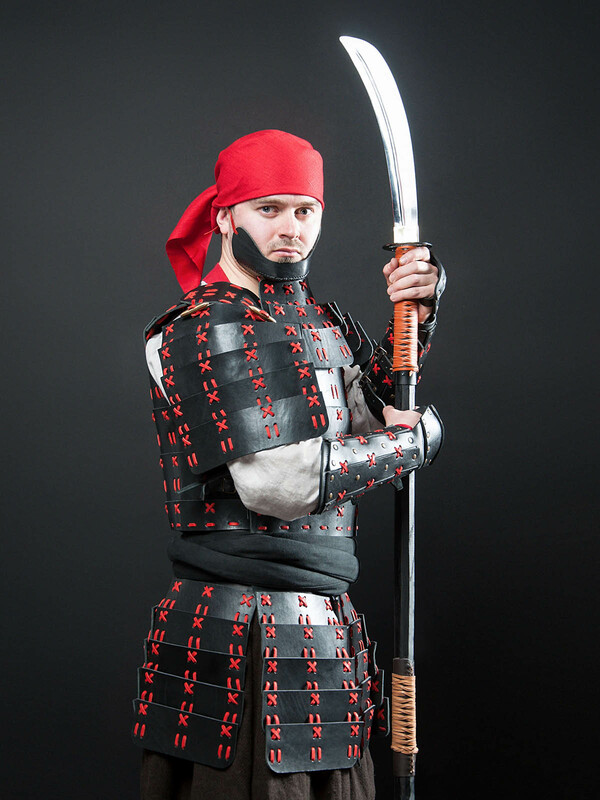 However, we did not add unhandy o-sode, which are good for cavalry battle, but added more plain and hardwearing sode, which perfectly complete domaru, protecting wearer and not hindering the arms’ movements. Well, what is below? 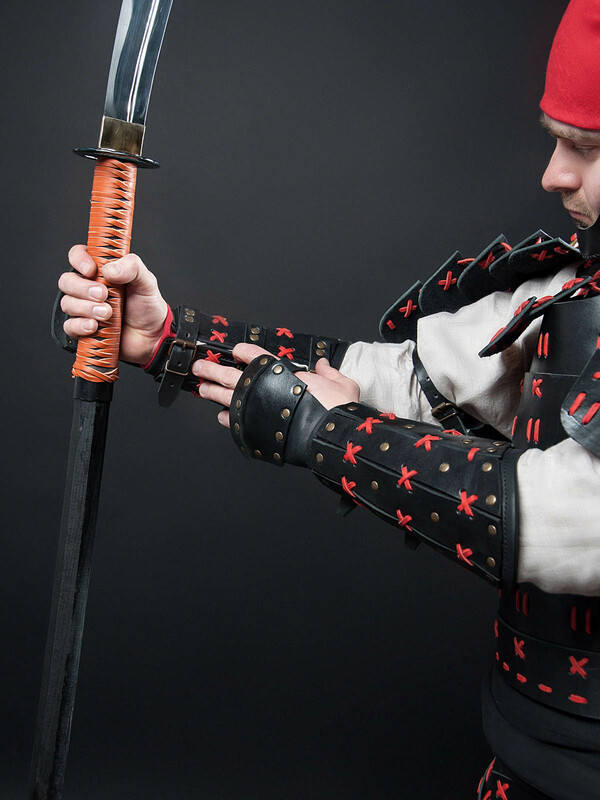 Below, there are kote armor – traditional Japanese han kote: bracers of long vertical strips and gauntlets, attached to them, which protect hand, but leave fingers free. It is easy as to fight, so to pray in them. Suneate protects calves of the humble warrior monk. 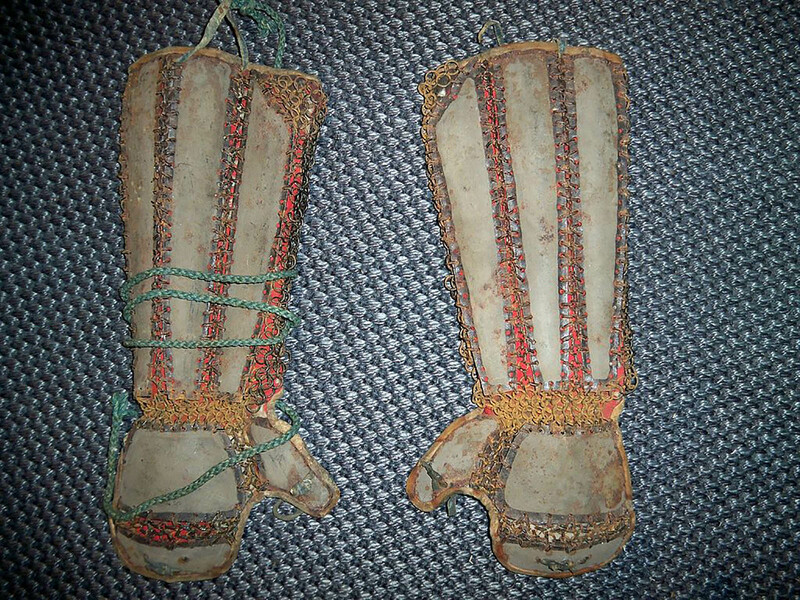 There are traditional plates greaves with protection of the knee and arch of the foot. Finally, chin and neck are protected with lighter variant of kabuto mask men-gu – hanpō. There is a choice of truly stouthearted men. This mask protects minimal part of the face and leaves the biggest breadth and movability, but demands the biggest swordsmanship. 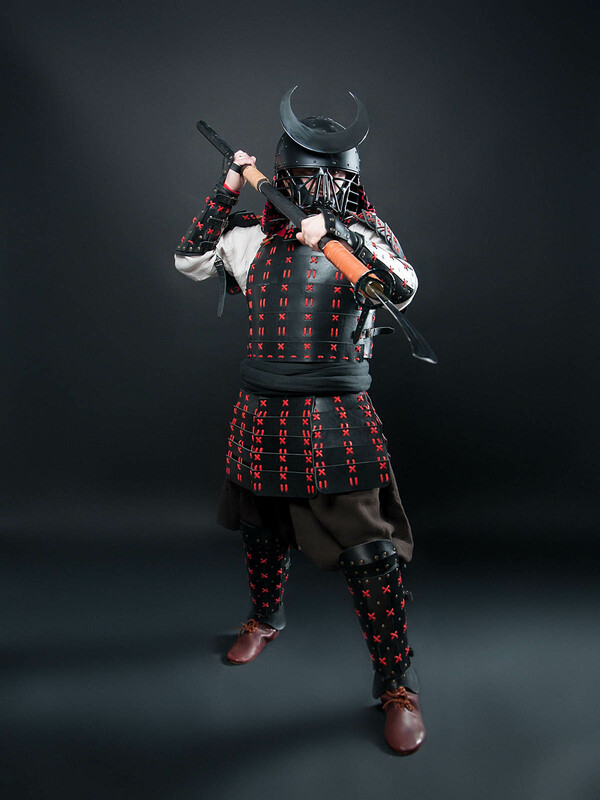 That is a set, strong, modest and genuine, just like legendary sōhei Benkei, who provided inspiration for our artisans for this Japanese samurai leather warrior armor. 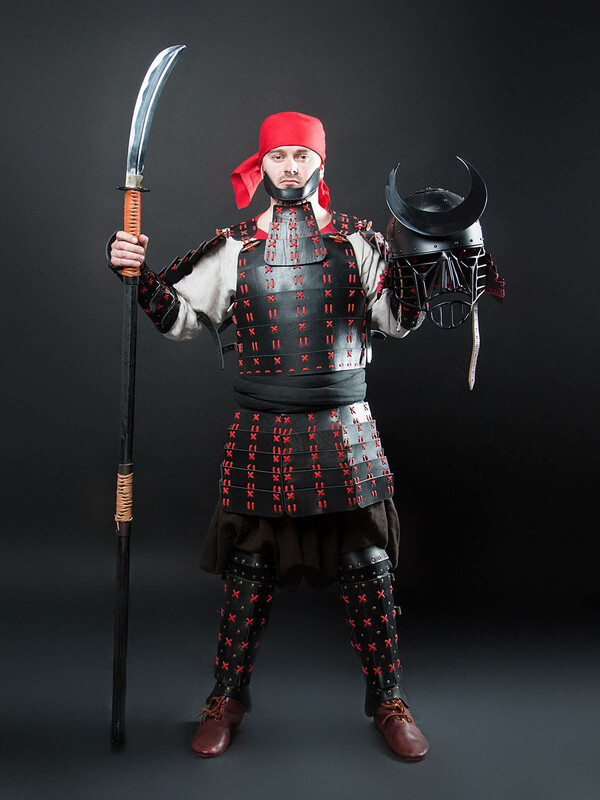 Helmet Kabuto and sword naginata are not included to the set. 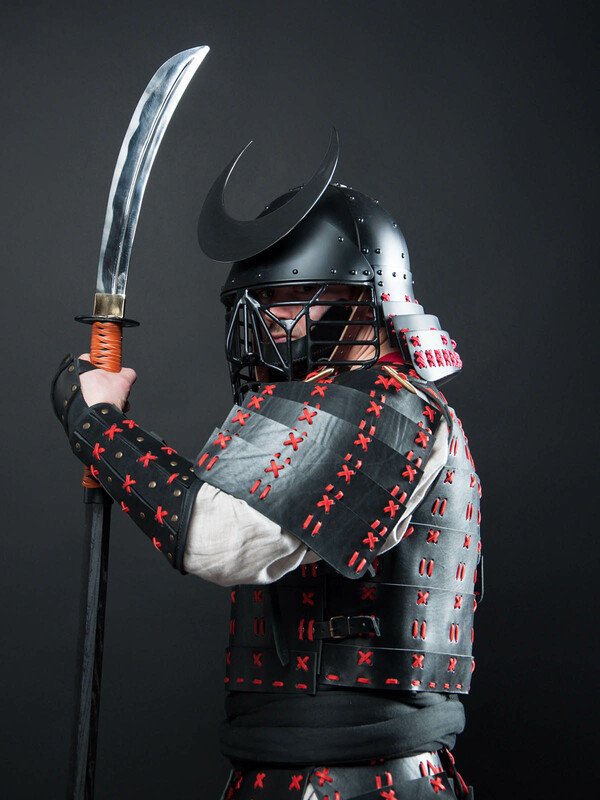 But, we recommend you to complete this leather set and order this medieval Japanese helmet. 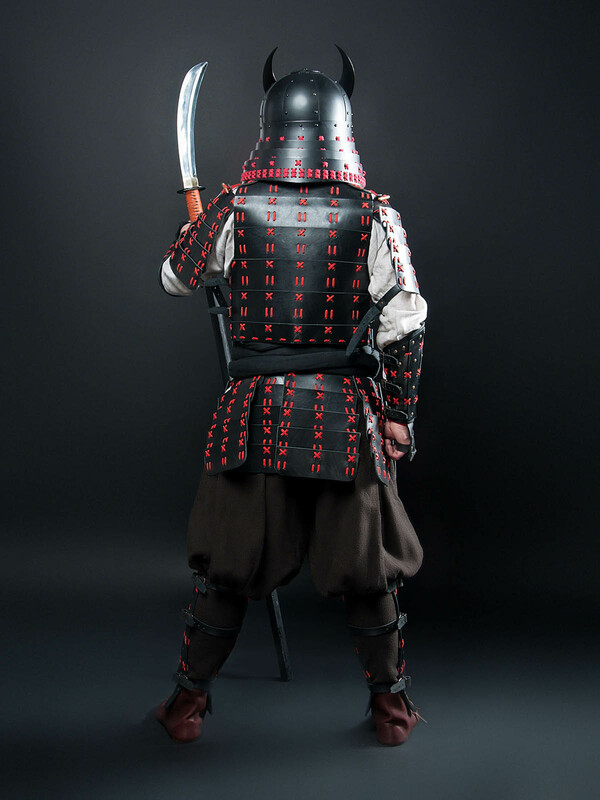 Besides, with Buddha’s blessing, after well-beseeming meditation, Steel Mastery blacksmith is ready to make haramaki (it is domaru, fastened on the back, not on the sides) and even one-of-a-kind and splendid O-yoroi for aficionados of beautiful armor. Helmet amd weapon is not included. Please measure your waist circumference. For gambeson - over normal clothes, for brigandine - over padded protection (gambeson). If your waist circumference between 63-69 cm (25-27 in.) - XS is your size! Please measure your waist circumference. For gambeson - over normal clothes, for brigandine - over padded protection (gambeson). If your waist circumference between 70-77 cm (28-30 in.) - S is your size! Please measure your waist circumference. 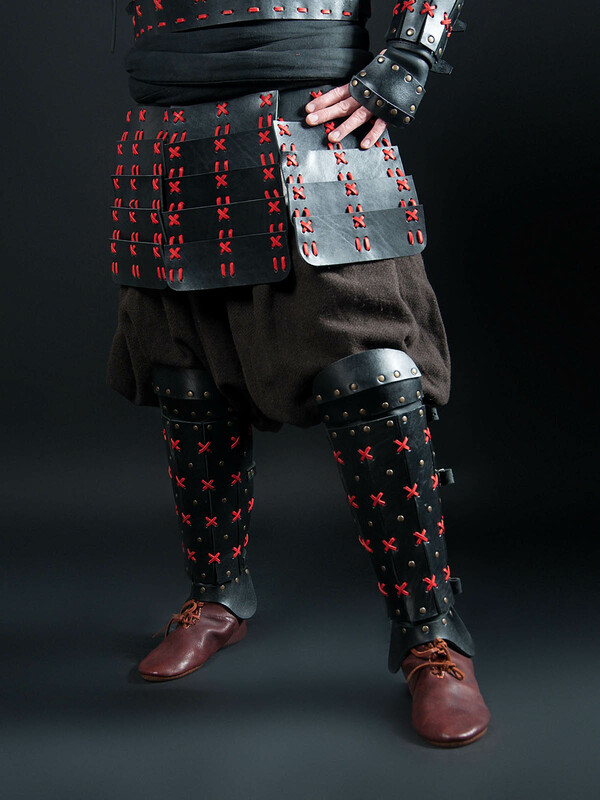 For gambeson - over normal clothes, for brigandine - over padded protection (gambeson). If your waist circumference between 77-84 cm (31-33 in.) - M is your size! Please measure your waist circumference. For gambeson - over normal clothes, for brigandine - over padded protection (gambeson). If your waist circumference between 84-91 cm (34-36 in.) - L is your size! Please measure your waist circumference. For gambeson - over normal clothes, for brigandine - over padded protection (gambeson). If your waist circumference between 91-102cm (38-40 in.) - XL is your size! Please measure your waist circumference. For gambeson - over normal clothes, for brigandine - over padded protection (gambeson). If your waist circumference between 102-117 cm (42-44 in.) - 2XL is your size! Please measure your waist circumference. For gambeson - over normal clothes, for brigandine - over padded protection (gambeson). If your waist circumference between 117-127 cm (46-50 in.) - 3XL is your size! Please measure your waist circumference. For gambeson - over normal clothes, for brigandine - over padded protection (gambeson). If your waist circumference between 127-137 cm (50-54 in.) - 4XL is your size! Please measure your waist circumference. For gambeson - over normal clothes, for brigandine - over padded protection (gambeson). If your waist circumference between 137-147 cm (54-58 in.) - 5XL is your size! The leather plates armour When the conversation drifts to armor, so knight metal armor is the first what crosses mind, or a chain mail at the very outside. 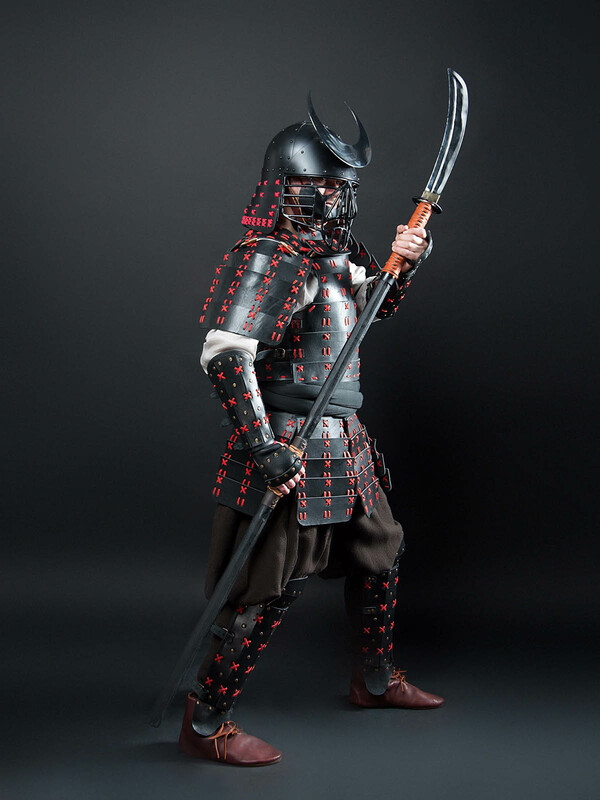 If there is talking of the Orient, so one remembers samurai armor. 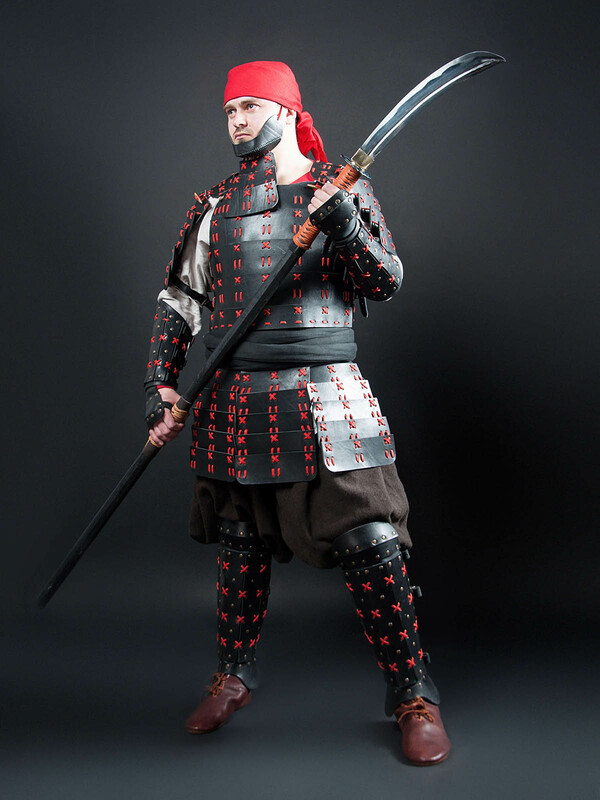 But, in such conversations, one usually forgets to mention armor, which warriors worn in the lands between Europe and Japan during centuries. Manufacture of such armor required considerable skills and patient work. However, it was almost non-defeatable armor without mobility decrease. 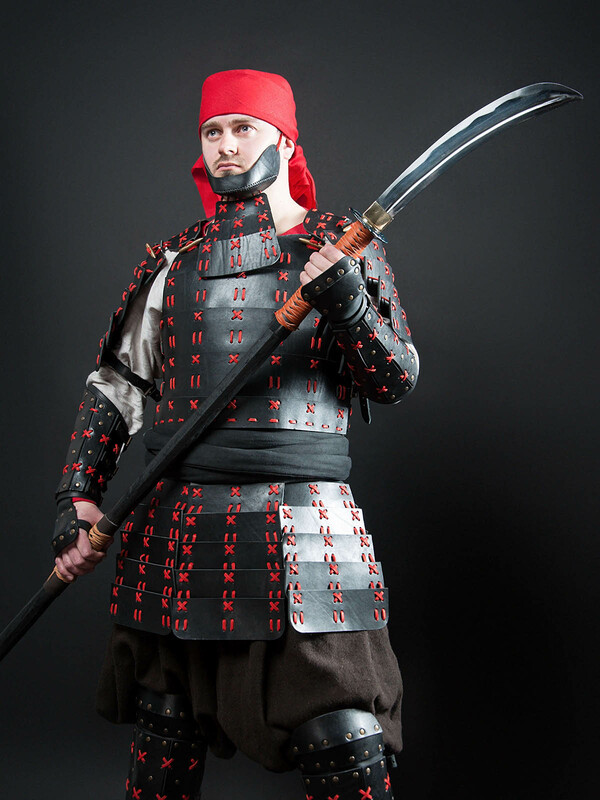 We are talking about lamellar armor. There is freaking old representative of body protection. One thing is for certain that Assyrians worn it in the 900-600 B.C. As the first Assyrian artifacts, which are classified as elements of lamellar protection by archaeologists, are referred just to that historical period. The earliest intact representatives of lamellar family of had been found in China so far. 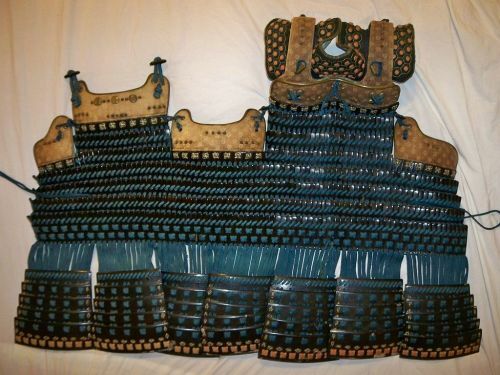 There are 12 sets of lamellar armor, made of lacquered leather, which were waiting for their time in the tomb Sui-hsien, Hupei..
Leather lamellar armor We would like to share this awesome and rare item with you – a copy of lamellar armor, worn by Jurchen warriors of the Eastern Xia (1215-1233 years). Are you confused? Don’t worry, we will tell you now. 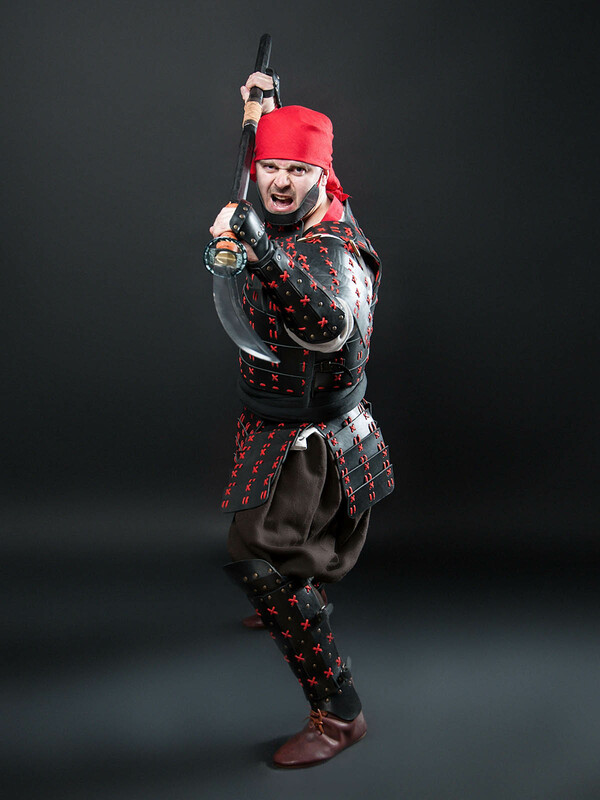 For entire five centuries, in the X-XV centuries, there were lived the Jurchen people on the lands of Manchuria, Central and North-Easter Chin and Primorsk Territory, who used armor very actively. They peaked in period from the 1115 until 1234 year. Nowadays, plates of the local lamellar armor are being excavated on the Primorsk Territory quite often. Findings from excavations from Krasnoyarovskoye, Shaiginskoye, Lazovskoye, South-Ussuriysk and Gusevskoye settlements told us a lot of the Jurchen armour. 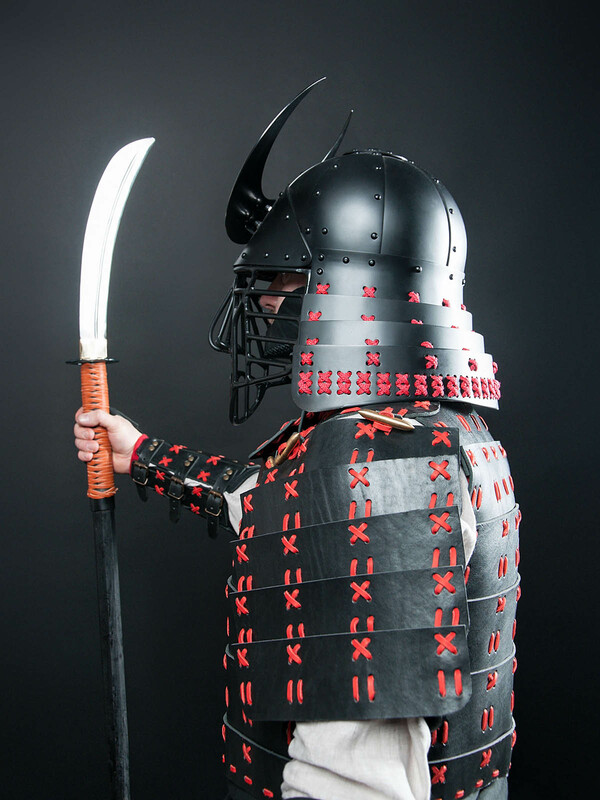 Yes, we could start our story about this armor like this way… Or, we could tell about Cataphract outfit, Chinese body protection, Avarian lamellar armors, Kerch lamellar defense, Old Turkic lamellar cuirass, Khudesutu Khuyag… We think we will spot on the feature, which they all have in..
Royal brigandine for SCA and fencing If we will appeal to history, we clear up the brigandine armor appeared in service of Europeans as an attempt to match something to Eastern lamellar armor, as chainmail couldn’t deal with it. If you are interested at details, here you can read about first medieval brigandines. There are histories about crusaders, full of pain and envy, who could not rob enough lamellar armor from nasty Saracens, so were inspiring European blacksmiths with money and beating for making of brigandine. However, it is not the entire story… To the end of the XIII century, when blacksmiths acquired skills and knights appreciated light and mobile protection, brigandine armor suddenly became… fashion one. Not only cavalrymen worn it, but also foot soldiers. Simple, but classy “masculine” accessory was appreciated at court. Then nobility, especially a young one, quickly got into brigandine. It is easy to understand them, as it was quite common thing in high society to be stubbed during morning tea-par..
Viking clothing outfit for men Odin, father of gods an people, was a great humorist. He was ruling Asgard and Æsir not only with powerful arm and with not too adequate decisions, but, on the spur of moment, he often went down into Midgard – to wander among the people for a while, to listen tittle-tattle, to drink some ale and simply to have a good time. As a rule, Odin was wandering in his own look of one-eyed elder, who wears a cloak and hat with wide flaps, with two talking ravens on his shoulders – Huginn and Muninn… And, he was scratching his head - why do people recognize him? Well, yes, only feeble-minded Viking could not take this one-eyed old man, wearing a cloak, with broadbrim, staff and two raven on the shoulder for Odin. So, wishing to wander without needless excitement and crowd of fans, he was choosing the less remarkable and recognizable public image. On one occasion, he was travelling in the simplest style and traditional Viking clothing. The one, which you see now here. Those days, father worn top-qual.. Medieval gown with wide fabric belt Double, double, Toil and trouble. Fire burn And cauldron bubble. When the night flies over the sleeping earth on the raven’s wings. When the wolves sing to the full moon in the bushes. When the cold wind dances on the tops of age-old fir-trees. When even the bravest one is afraid to get close to the mountain Brocken… Then, carelessly throwing a broom away and proudly straightening her shoulders, she slowly and proudly sets bare feet on the ancient rocks. She leisurely vaults to the top, where the boiling cauldron, unfailing friends and cheerful comrades are waiting for her. Her clothing is simple and perfect in its simplicity. Long and wide black medieval dress of thin, but hard cotton drizzles down her body, hiding and emphasizing curves. Puffed sleeves look like black bird’s wings. Neckline may be laced very tight, covering even collarbones; or freely opened, baring delicate shoulders. Her waist is tightened with firm wide belt, laced with ribbon. This belt shines..